This Georgetown walking tour is is offered in partnership with DC Design Tours. 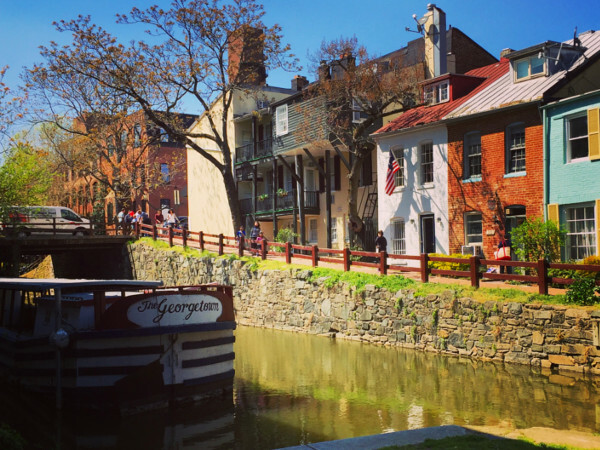 Established fifty years before Washington DC, Georgetown began as a gritty port city on the banks of the Potomac River, described by Abigail Adams as a “dirty little hole”. Despite its modest start, Georgetown is now home to palatial mansions, elegant cemeteries, stately churches, and a world class University. Explore the highlights of DC’s most exclusive neighborhood while learning about Georgetown’s transformation in this rags to riches tale. This tour meets outside the coffee shop Baked and Wired at 1052 Thomas Jefferson St NW. The tour takes 2 to 2.5 hours and covers approximately 2 miles, ending at the Georgetown Waterfront. Click here to see a map of the tour route! This Georgetown walking tour is led by one of the guides from the DC Design Tours team. Check out this video with Carolyn from DC Design Tours to meet one of the Historic Georgetown tour guides. Click or tap here to use the booking calendar to see when this tour is running and book it. Use the promo code DCDESIGNHACK for a discount!